There were truly special circumstances under which the mask presented here changed its owner in the 1960ths. For many years it was in the personal use of "Fon Happi II Taffou", the King of Bana (near Bafang), Cameroon. But because the mask could not save the king from the deadly sleeping sickness, he gave it to the man who was able to do exactly that. 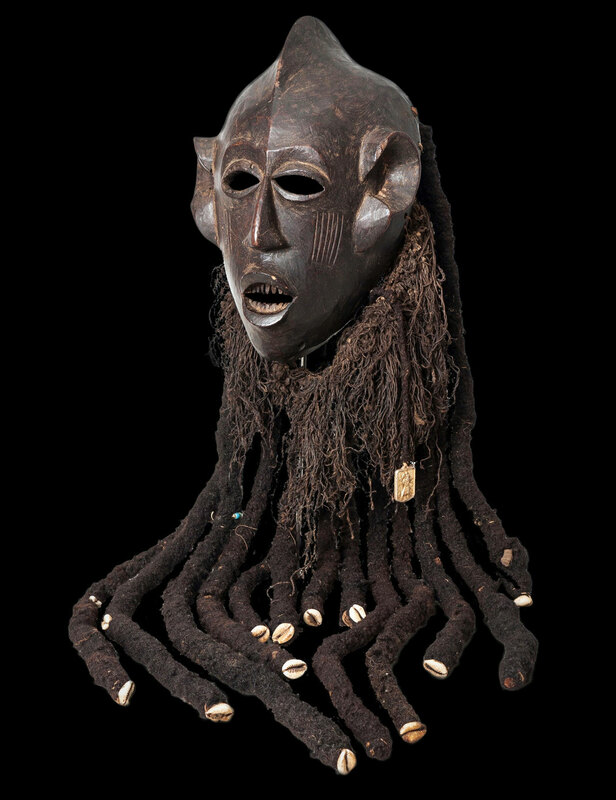 Even though this act deprived the mask of its ritual power, it has been able to keep a special secret until today: it belongs to a previously unknown trio of Ku n'gan masks of outstanding aesthetics and impact. It is the Lost Ku n'gan Triplet. 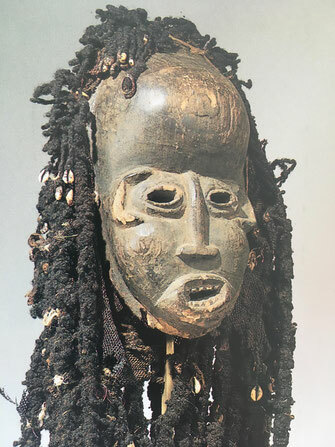 It is this mask of the Bamileke, Cameroon. Unlike in the northern and eastern grasslands of Cameroon, the masks of the Bamileke region were often not worn onto of the head but in front of the face. Masks of this type also have a pronounced expressive and aggressive expression. This results from the strong interplay of the individual characteristic features - the large ears, the almond-shaped eyes as well as the human hair wig and above all the resolute crest of the head, which is should be based on the bone crest of the male gorilla to transfer the power of the gorilla to the wearer of the mask. The shiny surface was created by a treatment with palm oil and soot after the mask was blackened over an open fire. 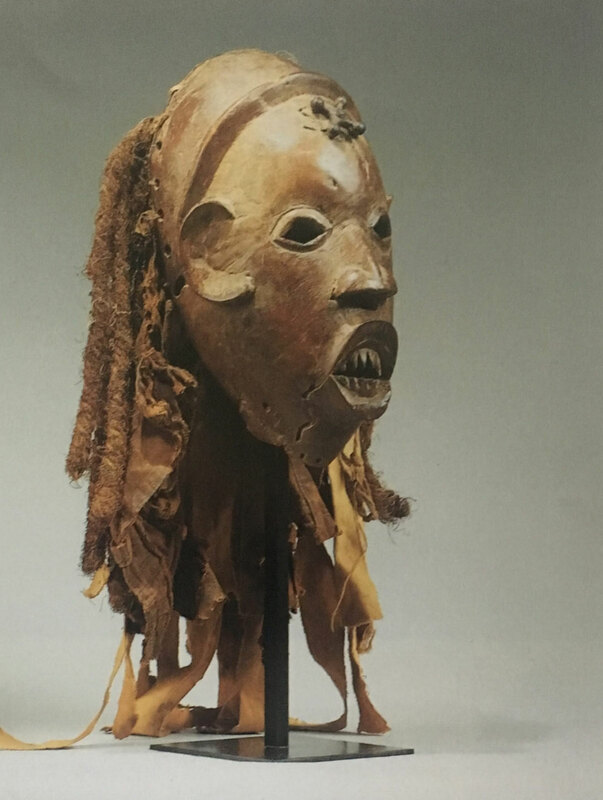 Regarding the correct ethnic name of this mask, the literature is not clear, "Kunga" or "Nkoh" may be true. 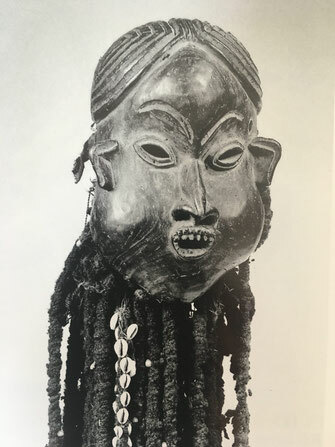 But the assignment of this mask type to the "Ku n'gan" society, whose magical, religious, agrarian and burial role in the royal courts of Bamileke country is indispensable, is clearly documented. This cult remains active to this day, acting both secretly and publicly. Membership has always been inherited. 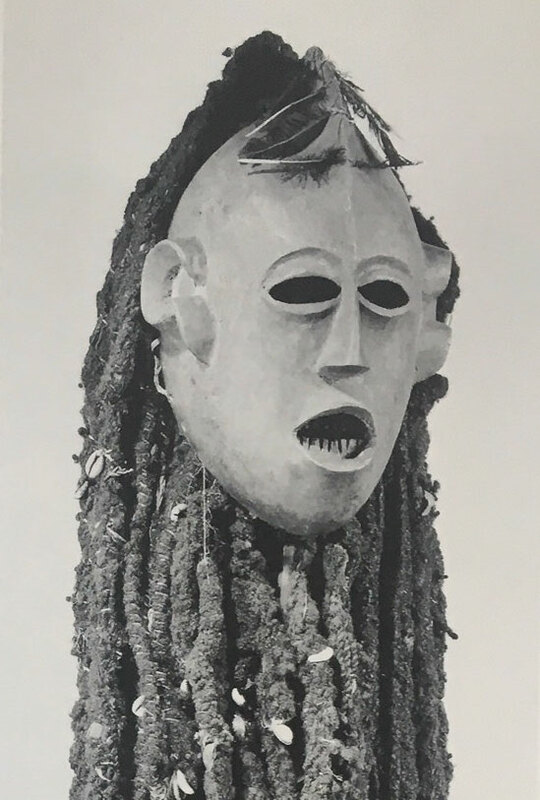 This mask was owned and personally worn by Fon Happi II Taffou, who was King of Bana from 1925 until the day of his death in 1980. Fon Happy was a member of the Ku n'gan Society and wore it on market days, when high-ranking notable citizens gathered in his palace for an audience. 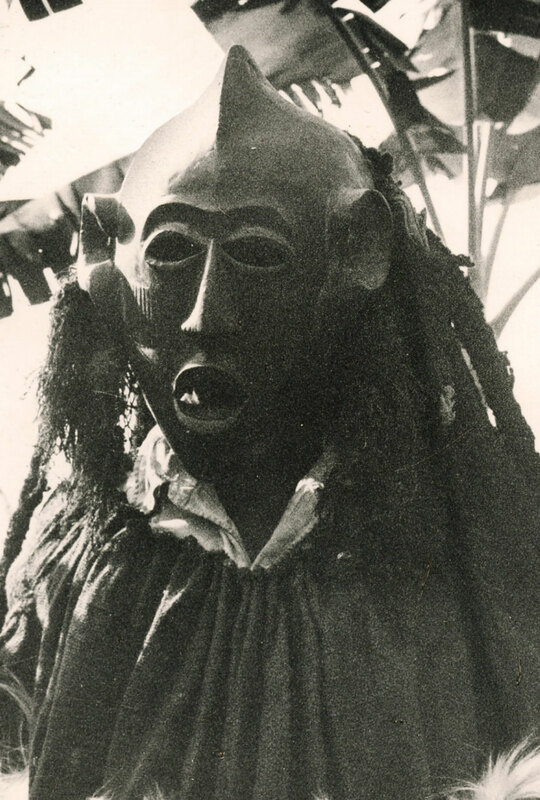 The mask was used on these days to ward off envy and witchcraft. Even though the king was also a representative of the Christian faith (what explains the golded plaque of St. Christopher), he did not renounce the power inherent in this mask. 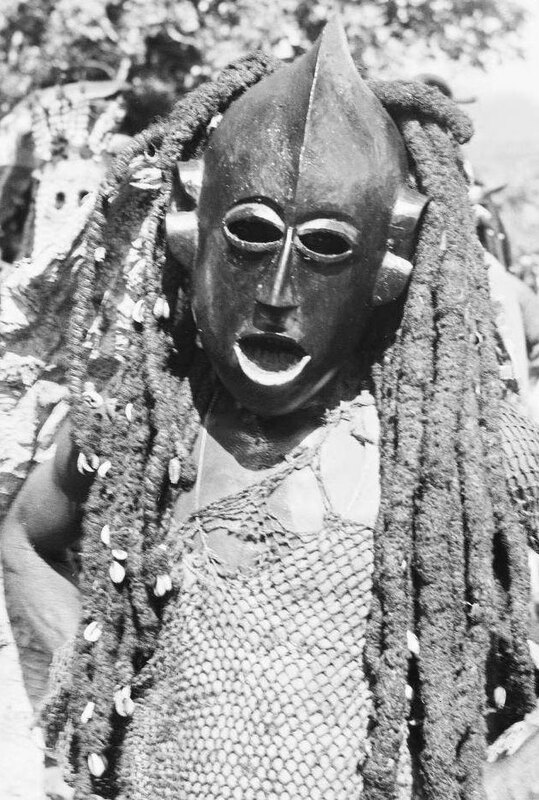 In 1964 the German nature photographer Klaus Paysan and his wife travelled the area of the Bamileke around the city of Bafana, Cameroon. In search of traditional masks, they visited the Fon of Bana hoping for the opportunity to take photos of his masks. 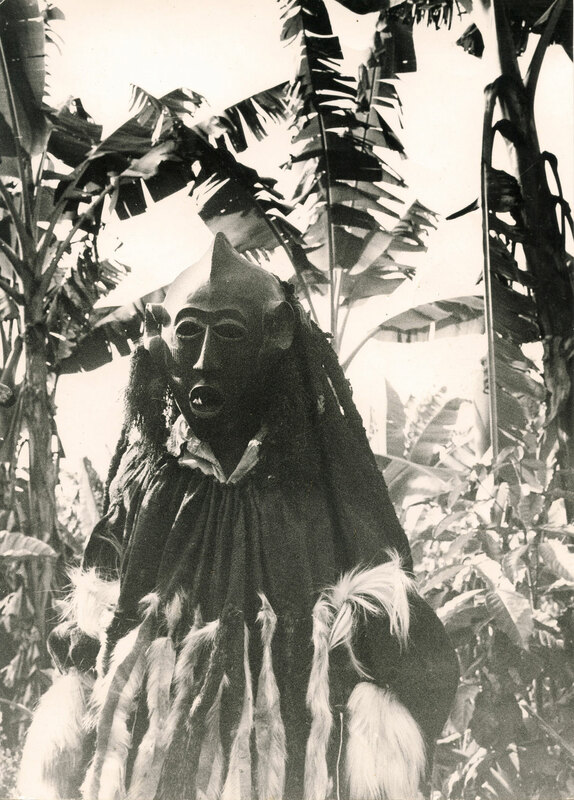 Since tradition did not allow the masks to be photographed during secret ceremonies, the Fon allowed Klaus Paysan to take the photo in a hidden place.. During a further visit to the palace of Fon Happi II Taffou, Klaus Paysan heared of the king's serious illness. Klaus Paysan, who has above-average medical experience, diagnosed end-stage of sleeping sickness. Fortunately, he had a medication with him that stabilized the king sufficiently to transport him to the nearest hospital. The Paysans traveled on and the chief recovered. Months later, on his next visit to Bana, Fon Happi summoned Klaus Paysan and thanked him warmly for saving his life. With the words "This mask could not protect me from disaster and illness but you could" he left his Ku n'gan mask to Klaus Paysan. So the mask had a new owner and he felt it anything but powerless. But unfortunately Klaus Paysan was not alone with this opinion. So the joy about this special tribal art object was unfortunately only of short duration - or was interrupted for several years. The fact was that the customs officers wanted to check the luggage of the Paysans when they left the country. One of them was Bamileke. He recognized the mask immediately and hastily closed the jute bag in which it was transported. He told the Paysans full of awe that this powerful mask could not leave the country under any circumstances. Klaus Paysan hung the bag in a customs warehouse on a roof rack and traveled back to Germany - without the mask. An export license was not granted until many years later. The main customs house had burned down in the meantime. But the sack was still hanging on the roof beam, covered over and over with the dung of the vultures who had meanwhile chosen this place as their sleeping place. The mask itself had not been damaged, as you can see. The direct comparison suggests that these 3 masks were carved by the same person. This impression is intensified when comparing these 3 with other masks of this type (see below). The similarity of ears, eye area, crest, nose and mouth is striking. The whereabouts of the first mask (International Mission Archive, 1945) are unclear. The middle one was offered on 21 June 1995 together with many other pieces of Pierre Harter's collection for 50,000/70,000 French francs at the Drouot Auction House and was subsequently owned by M. Alain de Monbrison. At Monbrison's request we were informed that this mask is no longer there today. The Paysan-Ku n'gan has been in the family's possession since 1964 and is now for sale for the first time, exclusively at Tribute Gallery. Below we show other masks of this type to support the thesis formulated here that the mask currently offered by Tribute Gallery belongs to a mask group of which so far presumably only one (The Harter-Monbrison, Mask II) has been publicly traded. The lower three example masks show clearly different traits beyond the parallels caused by the type. Although the mask with the metal cross on the forehead is reminiscent of the Ku n'gan triplet, especially the mouth. 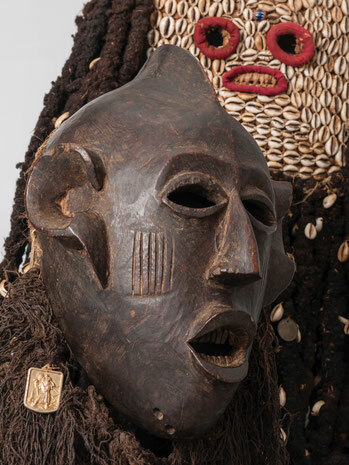 This one comes also from Pierre Harter and Alain Monbrison and was offered at 2014 at Christies by 40.000/60.000 EUR - perhaps this mask is an earlier work of the unknown triplet carver.